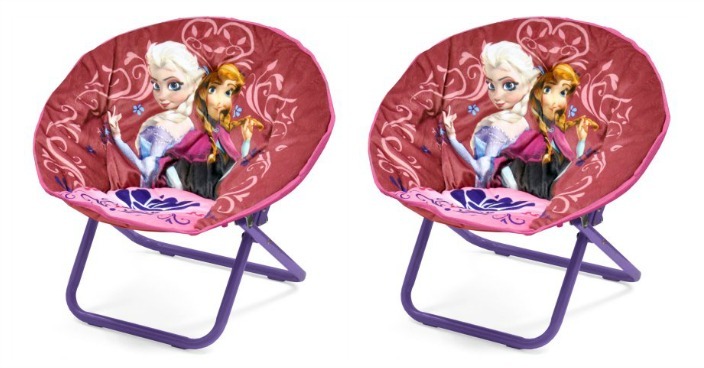 Disney Frozen Mini Saucer Chair Just $13.98! Down From $25! You are here: Home / Great Deals / Disney Frozen Mini Saucer Chair Just $13.98! Down From $25! Right now you can get this Disney Frozen Mini Saucer Chair for just $13.69 (Reg. $25) at Walmart! The Frozen Mini saucer chair has an image of Elsa and Anna on it. Every child will love using this chair because of these two and the comfort of the chair. This portable and collapsible chair can be used in any room of the house and can be taken with you anywhere. This chair is made of 100% polyester and is extremely durable because of the grips located on the bottom of the chair. The size of the chair is 18″ L x 18″ W x 18″ H. This Frozen saucer chair is fun and comfortable, making it the perfect accent to a room.